June 10, 1932, Emil Werner. 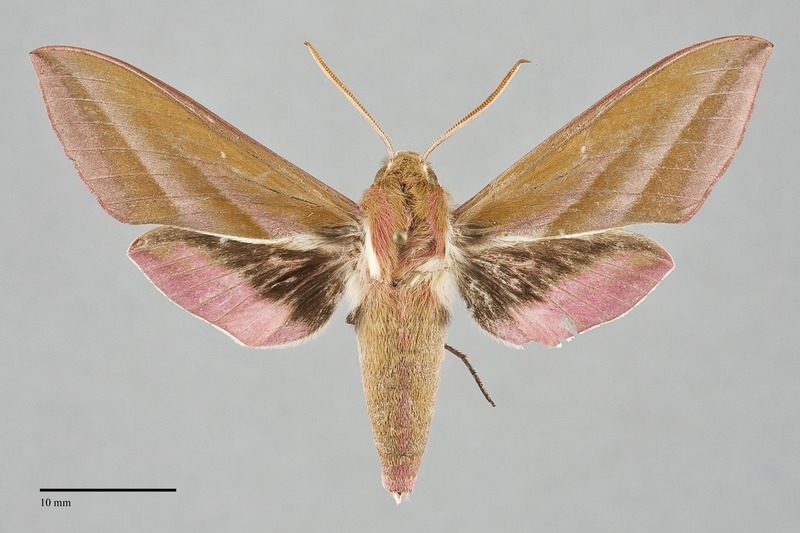 Deilephila elpenor is an attractive olive-green, pink, and black large (FW length 26 mm (n=1)) Eurasian sphinx moth that was discovered recently in the Lower Fraser Valley of British Columbia. The forewing is typical in shape for the family and is smooth olive to bright green. The costa, terminal area and fringe, and the oblique straight post medial and subterminal lines are pale to bright pink. No spots are evident. 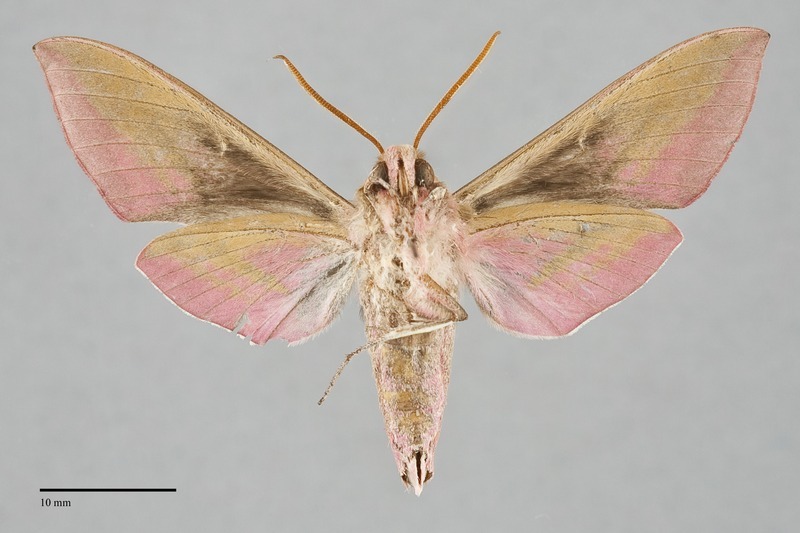 The hindwings are bright pink with a black basal area and white fringe. The head, thorax, and abdomen are olive variably tinted with pink, with white lines on the lateral tegulae. The pale antenna is club-like. 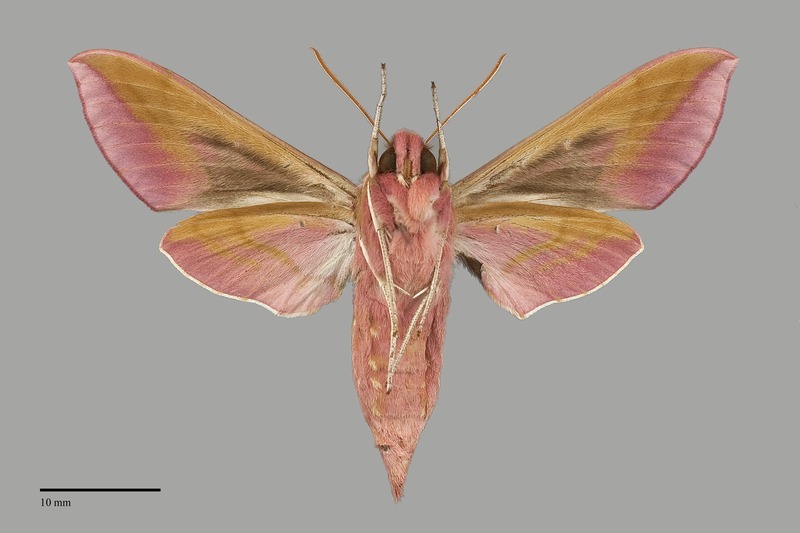 This moth is easily identified by its olive-green and pink color and large size. 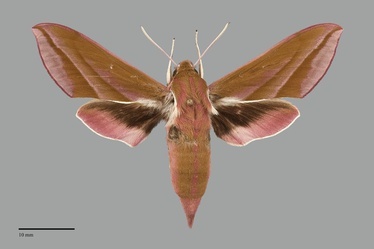 It is only likely to be found near Vancouver, British Columbia, but could conceivably spread to other parts of adjacent British Columbia and Washington since its food plant is widespread and common. Few if any immature stages have been discovered in North America so morph variations are unknown. In its original European habitat there are both brown and green morphs. Later instars can telescope three of its thoracic segments into the first abdominal segment to enlarge anterior eyespots in response to a threat. This exotic Eurasian species has been discovered at one site in North America. It prefers open sunny wetland habitats near creeks and marshes. The only Pacific Northwest observation of this species was at Pitt Meadows east of Vancouver in southwestern British Columbia. It is unclear how the species was introduced or if it has started to spread to other areas. It has been suggested that this moth was released deliberately by an amateur entomologist, but this has not been substantiated. This is an introduced Palaearctic species. Larvae typically feed on plants of the family Onagraceae, with fireweed (Epilobium spp.) being the most likely candidate in British Columbia. Feeding occurs either diurnally or nocturnally with the larvae retreating to the middle of the plant when not feeding. Pupation occurs in a cocoon of loose silk and debris at the surface of the ground. It appears that is a single generation per year in North America with flight period near midsummer. Adults are active well after dark when they feed on nectar at flowers and copulate. Females begin oviposition as soon as copulation is finished.